The 2019 Alfa Romeo Stelvio SUV is a luxurious force to be reckoned with. We’re excited to have the revamped model available on our lot at Alfa Romeo of Glenbrook. 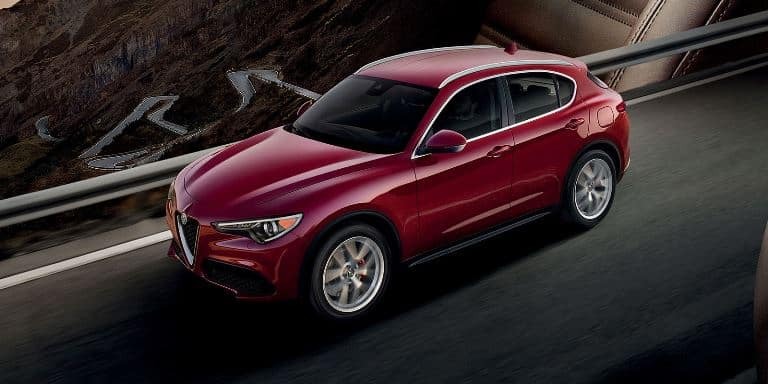 Whether you’re looking for vast cargo space, ample power, or family-friendly features, the 2019 Alfa Romeo Stelvio is sure to meet your every need. This five-passenger SUV near Indianapolis, IN comes in three trims and four configurations, providing you numerous options. What powers the Alfa Romeo Stelvio is where the real fun begins. The 2.0-liter turbocharged engine is all new, and it puts out a best-in-class 280 horsepower and 306 lb-ft of torque. It reached a top speed of 144 mph, and it rockets from 0-60 mph in a swift 5.4 seconds. In the top-level Quadrifoglio trim, the 2.9-liter engine churns out a breathtaking 505 horsepower. All trims equip an eight-speed automatic transmission with overdrive and auto-manual. New for the 2019 Alfa Romeo Stelvio is a rear-wheel drive (RWD) base model. To truly fine-tune your ride, the Stelvio comes equipped with the Alfa DNA Drive Mode Selector that provides three settings: Dynamic, Natural, or Advanced Efficiency. For true thrill enthusiasts, opt for the available Premium Performance Package, which comprises an active suspension, aluminum steering wheel-mounted paddle shifters, and a limited slip differential rear axle. This new Alfa Romeo SUV at our luxury car dealership is packed with safety and security features designed with you in mind. Distance pacing cruise control is an added security measure, as well as blind spot monitoring, full-speed forward collision warning plus, and lane departure warning. For entertainment, the 2019 model comes standard with Android Auto™ and Apply CarPlay™, allowing you to sync your smartphone to the vehicle seamlessly. The 8.8-inch touchscreen is integrated across all trim levels, and there are four USB ports for ample charging capability. Thanks to the steering wheel-mounted controls, multitasking at the wheel is as easy as ever. To learn more about everything that the 2019 Alfa Romeo Stelvio has to offer you and your family, visit our Alfa Romeo dealers in Fort Wayne today. We’re happy to set you up with a test drive and address any questions! We look forward to your visit.